This month, designer Andrew Wilson leads an armchair tour of sculptures made from different materials that can create drama among planting in gardens large or small. RHS Principal Scientist James Armitage recommends some dynamic acacias suitable for growing in sheltered spots in the UK. 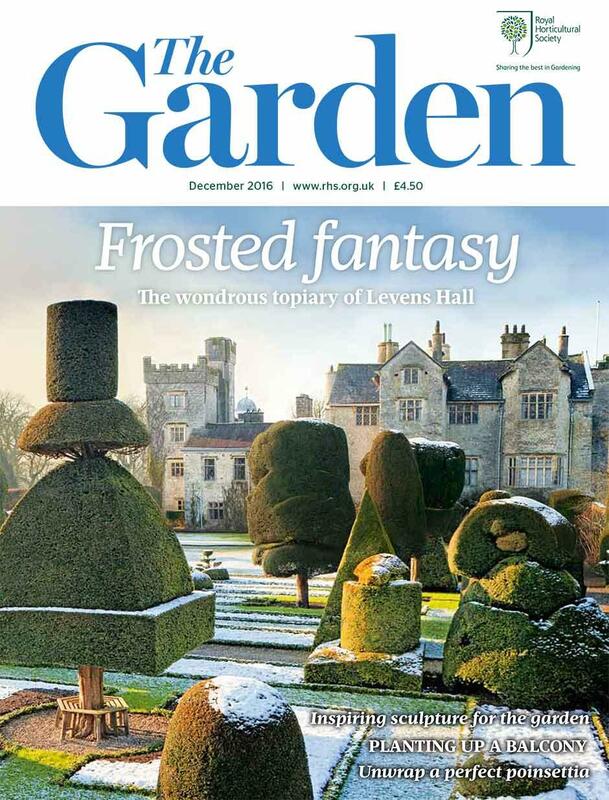 Roy Lancaster recalls how he found and introduced a useful shade-tolerant evergreen from the Black Sea region of northeastern Turkey, while garden writer Caroline Beck expresses her love of the timeless serenity of the late 17th-century topiary at Levens Hall, which continues to capture the imagination of generations. Finally, former Trainee Horticultural Journalist Nicola Oakey reveals exciting winter interest at the four RHS Gardens, where winter gardens have undergone redesigns with fresh planting. Join us for a celebration of the Christmas season at the RHS London Christmas Show, combining local, independent food producers, artisan craftsmen & specialist nurseries, 17–18 December. Read practical advice from the RHS Gardening Advice team, on jobs to do in the garden in December.